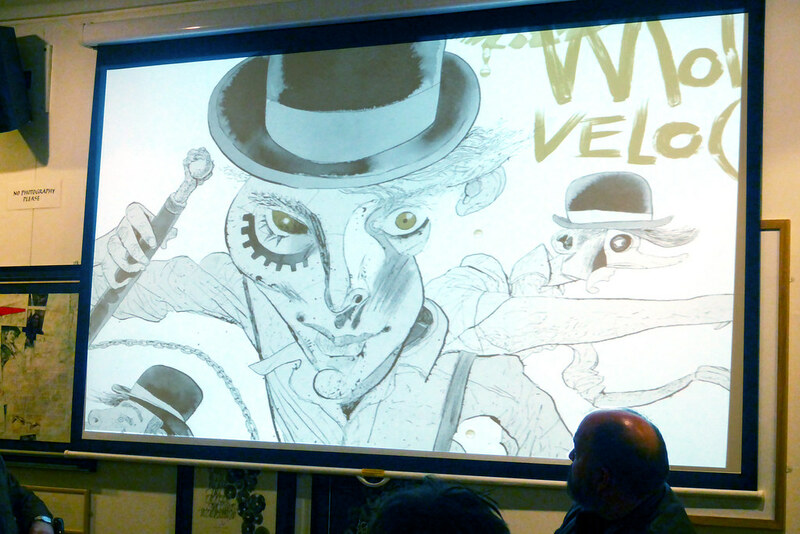 At Tuesday night’s Comica festival event at Foyles, McKean demonstrated yet another string to his creative bow. 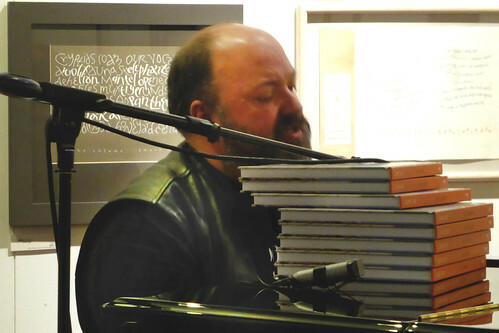 Dave McKean sings and plays piano at the Comica event in Foyles’ 3rd floor gallery. 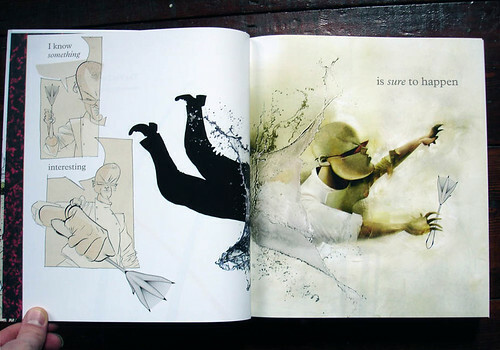 Top: McKean shows cover illustration for a Brazilian version of A Clockwork Orange. He bookended the presentation with two songs from his new project Nine Lives, first performed earlier this month (with strings, percussion and trumpet) at the Sydney Opera House Studio as part of the annual Graphic weekend of storytelling, animation and music. For this more modest, relaxed event, held in the 3rd floor Gallery at Foyles, London, McKean sang and played piano, accompanied by a laptop backing track and an accompanying narrative video – with both animation and photography – projected on a screen. 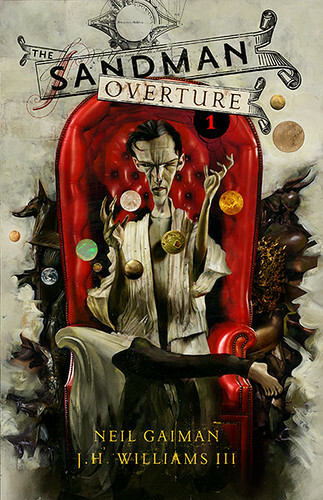 McKean’s cover for The Sandman Overture by Neil Gaiman and J. H. Williams III – out today (Wed 30 October 2013). The bulk of the evening was taken up by a chat with Comica founder Paul Gravett, with accompanying slides that gave the audience a glimpse of McKean’s glittering career as a graphic artist, pegged (to a certain extent) to the new Sandman Overture, issued today, and Gravett’s forthcoming Comics Art (Tate), out next month, which features McKean’s work inside and on the back cover. 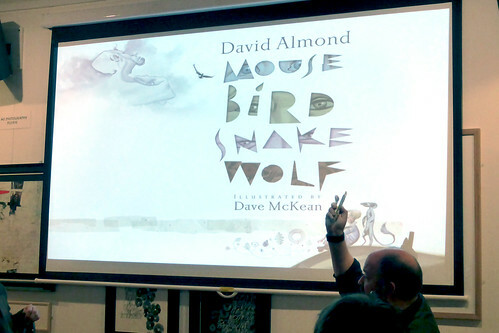 Dave McKean talks about his collaboration with David Almond for Mouse bird Snake Wolf. 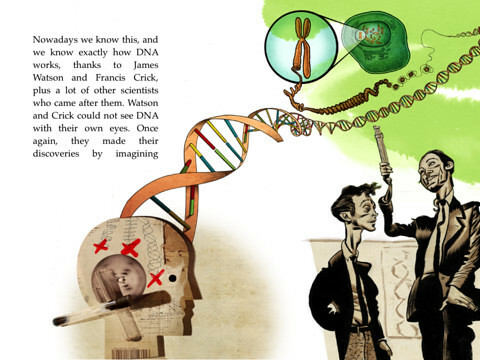 … and with Richard Dawkins on his book (now an app), The Magic of Reality. After working with the super-rational Dawkins, McKean went straight into the mystic – a three-day shoot at Port Talbot to film a passion play with a cast of thousands of local people and Michael Sheen as the Christ-like central character. The resulting movie, The Gospel of Us, was released theatrically in 2012, and is now available on DVD. In order not to spoil the spectacle, McKean’s camera crew agreed to shoot from concealed locations. The paparazzi photographers who descended upon Port Talbot to shoot Sheen had no such inhibitions. McKean explained that much of his editing time was taken up in cutting round footage where photographers got in the way. He finished the evening with the melancholy ‘Sheepdip, Johnson and Dupree’, sung in sync with a monochrome video in which three characters in giant masks cavort in a chilly English field. McKean – unmasked – mades a cameo appearance at the end of his charming song.